Apparently, JDeveloper is not packaged with JDBC driver library for MySQL. So let us go and down load it from the MySQL download centre for absolutely free. The latest version currently available is mysql-connector-java-5.1.7-bin.jar. Copy this library to a known location such as <jdevhome>/jdev/lib which needs to be supplied at later stage when we setup the application environment. 1. Go to Appliation Navigator-> Select New,this opens up a Create New Application wizard. Now let us try adding the JDBC driver jar for MySQL to the classpath of this application. 1. Form the main menu toolbar, select the Application menu. 2. Select 'Default Project Properties'. 3. In the tree view select "Libraries and Classpath". 4. Click On the "Add Library..." button. 6. 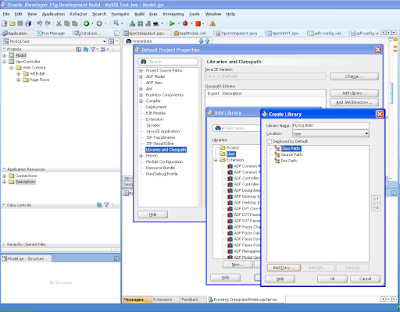 "Create Library" dialog is displayed. Name the library as MySQL JDBC. Select location as user from the drop down. 7. Click on Add Entry. 8. From 'Select Path Entry' dialog, navigate to the JAR file for the MySQL Connect/J JDBC driver (it should be called something like mysql-connector-java-<version>-bin.jar). 9. Click on the jar file and click Select. We have copied this jar file to /jdev/lib during the infrastructure setup. 10. Click OK on Create Library Dialog. 11. Click OK on Add Library dialog. 12. One more time OK on Default Project Properties dialog. 1. Go to Application Resources pane. Right click New Connections->Database. 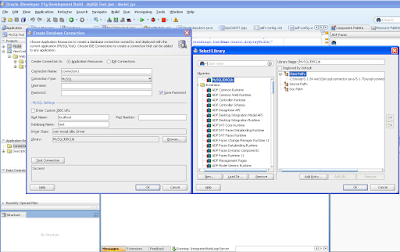 Create Database Connection wizard will be displayed. 2. Define your connection name as you like. 3. From the Connection Type dropdown list, select MySQL. 4. Set the username and password and click deploy password. 5. Enter MySQL settings. Enter HostName,DataBaseName and port name as per your MYSQL server configuration. 6. Click on 'Browse' button next to 'Library' field. In the 'Select Library' dialog choose the MySQL JDBC library that you defined earlier ( while setting up the application environment). 8. Click to Test Connection. Before staring this step please keep an eye on following two points. 1. MySQL does not support RowID. Implies that you cannot use RowID as a replacement for a primary key. 2. All tables must have a primary key. Please refer Fusion Developers Guide for more details. 1. Right Click the model Project , select "New". 2. From the Gallery select "Business components From Table". 3. From the 'Create Business components From the Table' select right schema and click on Query. 4. If all the configurations are correct then we can see the the tables defined in the schema/DB is displayed. Proceed to create Entities and Views and finally press finish. The above steps are sufficient to run the application from AM Tester. But when you try deploying it, application server may throw following error. • How would this work if I am NOT using JDeveloper, and want to build the project using Maven? • It would also help if you can add an outline of the tasks and then start detailing them out? Thanks RS for the comments! Basically files needs to be touched are bc4jxfg.xml and connections.xml files. Your suggestion sounds useful, will update the blog detalining the steps involved while using maven soon. I followed the blog, at the end i tried to add mysql jdbc to weblogic classpath. 1. Open setDomainEnv.cmd file located under \Application Data\JDeveloper\system\DefaultDomain\bin. I have the same problem, I follow all the steps and the problem is still there. Great Post. I would like to see other way instead modifing the setDomainEnv.cmd file. I just drop my .jar file in "\Application Data\JDeveloper\system11.1.1.1.33.54.07\DefaultDomain\lib". And it works. It is with integrated server. But when we deploy to the standalon weblogic I don't need to do any extra step if I push my .jar file under /WEB-INF/lib folder. And in project-properties I need to point the .jar from this location when we set up Libraries and Classpath from project-properties. thanks Subu for your input, sounds like a better solution! I'm new in JDeveloper and I wish to migrate an application. For this reason, I wanted to use the database in MySQL server. I following all the steps in your post but the problem is still there. The message is java.net.MalformedURLException: unknown protocol: c.
I added the line: set WEBLOGIC_CLASSPATH=%WEBLOGIC_CLASSPATH%;C:\Users\Diego\AppData\Roaming\JDeveloper\system11.1.1.2.36.55.36\DefaultDomain\lib\mysql-connector-java-5.1.10-bin.jar in the folder setDomainEnv.cmd. Can you help me please. What do I have to do? The path you have mentioed is it properly being pointed by your jDeveloper? Just I had a try in my dev box, even withought setting classpath it is working. On my previous comment i mentioned path as C:\Documents and Settings\\Application Data\JDeveloper\system11.1.1.2.36.55.36\DefaultDomain. C:\Documents and Settings\login user\Application Data\JDeveloper\system11.1.1.2.36.55.36\DefaultDomain. I used less than and greater than sign around "login user", Hence i feel it has appeared as blank i.e. //. Your tip was very helpful. I was able to use JDev + ADF with MS SQL Server following that same tip you gave for mySQL! See the JDeveloper log output for additional information"
Is there any other place in WebLogic or Jdeveloper when I can place my driver in order to graph to work? Sounds like system is not able to find your MS SQLServer driver libraries. Do you able to run the ViewObjects from the AM tester? Error happens only when you run from WLS? AFIAK, there is no need to set libraries anywhere else other than WLS classpath. I've realized that the Graph Preview does not work inside jdeveloper, but works fine in WLS. I just needed to restart the server. Thanks a lot for the article... it was very helpful. how should I enter to variables. after the question mark or where ? I'm running Jdeveloper 11g and MySQL on mac, after I follow your steps to add msql-connector-java-5.1.17-bin.jar to Appliation->default project properties -> Library and copy the file to /Users//.jdeveloper/system11.1.2.0.38.60.17/DefaultDomain/lib I can compile and start "run" for the page without any error (Database test connection is success), but when the page load information from DB, I got error " java.lang.ClassCastException: com.mysql.jdbc.JDBC4Connection cannot be cast to oracle.jdbc.OracleConnection" .... same error occur when I run AM tester ...... do I miss anything? I'm also an ADF developer but after reading your blog, am i really? I am using MySQL for my ADF application,and trying to run AM, but getting the error as "No suitable driver found for jdbc:mysql://localhost:3306/dbname". Please advice where I am missing. FYI- In the log file I am getting something as below- even though the username and password is correct!